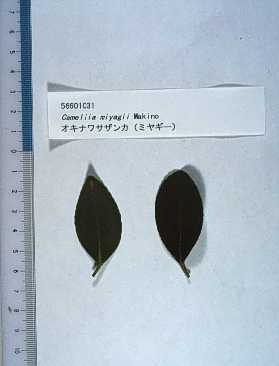 Compared to C.sasanqua distributed in Kyushu and Shikoku,this flower isreported to be smaller and have less hair on leaves and new branches.Butbecause some C.sasanqua has these characteristics, it is often classified as C.sasanqua by botanists. However,these two species are completely distinguished in western country as breeding materials.Here therefore,those found in Amami-Oshima and further south are classified as C.miyagii. 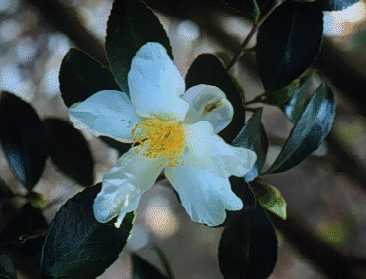 Flowers:White,5-7 petals,5-6cm in diameter,fragrant.Flowering in October to December. Leaves:Elliptic to Oblong-elliptic, 4-6cm long and 1.5-2.5cm wide,shining,green to deep-green. Venation is obscure.